When you first start skateboarding, you simply have no need for an expensive pro deck. Your first boards will get thrashed beyond recognition quicker at this stage than any time later in your skate career. Because you’ll be going through them so fast, buying pro models will get expensive really quickly. To save yourself, or your parents, some hard-earned money, consider riding blank decks until you improve. These boards are essentially the same as the best skateboard decks in the industry, but can cost a fraction of what pro boards go for. The blank deck has long been a staple in skateboarding. Once upon a time, every skate shop sold its own variety of blank decks. Because they cost half as much as pro models, these boards were sold well. They gave skaters with less money in their pockets the chance to ride better wood, retiring the boards they often rode to splinters. One of the main reasons blank decks cost less is because the company selling them saves the money usually spent on expensive graphics and transfers the savings on to you, the rider. Often, a board with graphics will be a professional skateboarder’s signature model. The pro makes money off each transaction, and board sales checks are a major source of income for the best skaters out there. There is nothing wrong with this system, but it does price some beginning riders right out of skateboarding. Another reason blank decks are more affordable is that they usually go straight from the manufacturer to the seller. The skateboarding industry is set up with several layers of middle men who mark up the product as it moves down the chain. The typical pro board goes from manufacturer to distributor, then to the pro’s company, then to another distributor, then to the skate shop and finally to the skater. With so many layers, it’s no wonder these boards cost so much. Again, there’s nothing wrong with the system. Skateboarding is a vibrant economy in itself. Many of the people occupying each level of distribution are former skateboarders, though many are simply businessmen reaping profits. The simple, affordable way around this game is to go naked! Blank decks, like most other products in skateboarding, are not all made alike. There is more than one way to make a skateboard deck, and the more reputable companies demand their manufacturers to supply them with the best. There are several factors that vary in skateboard production that can mean the difference between pop that lasts, and split layers. Check out this Video from How It’s Made that shows the manufacturing process of a skateboard deck. As you look through catalogues and websites, you will likely see skateboards made from all sorts of materials. Whether plastic or wood, maple or bamboo, the material makes the board. For the purpose of street skating – or ramp or park ­– only pure maple will do. Most skateboarders specifically prefer Canadian hard rock maple, though American maple is common as well. In recent years, a debate has centered around the use of Chinese maple, which is not a cold-weather type, in skateboards. Supposedly, cold-weather maple has a tighter grain, which makes for more pop. Anecdotally, I believe it, and experience tells me it’s true, but there have been no scientific studies to back up the mythology of Canadian maple. Another place manufacturers save money, and the place that likely has more effect on the quality of a board than where its wood was harvested, is the quality of adhesive used. There are adhesives on the market designed specifically to make skateboards, but they are expensive. In order to use this adhesive, manufacturers must pass the cost on to the consumer. So, logically, a board priced below a certain point is either being sold at a loss – ha! – or utilizes a lower-grade epoxy. For beginning skateboarders, this epoxy should be fine. When the stresses on the board get extreme, though, cheaper glues fail and allow the layers to come apart. Water is also the enemy of cheaper adhesives, and even getting a board damp can prove disastrous. This article from a small skateboard manufacturer lists the types of adhesives used in decks. This article in Transworld Skateboarding magazine discusses the science of skateboarding and skateboard production. The modern equivalents of the old skate shop blanks are listed below. There are others on the market, but these boards have a track record of reliability and the shapes street skateboarders are currently riding. No one will know you’re skating a blank unless you tell them, and if they care they aren’t a true-blooded skater. Starting out on one of these boards is a smart move, though they will also make great replacement decks whenever you’re in a pinch for funds. So, here are five of the best, most user-friendly blank skateboard decks available in 2017. Forestone blanks are a great place for a beginning skater to start. The tail and nose have generous kick – or upturn – with the nose having just a bit more than the tail. The concave in these boards is on the mild side. This is a good combination for the beginning skater, as the slight concave is comfortable without trapping your feet in place, making for easier bails. Also, the lower tail kick will make learning to ollie easier. The Forestone blank comes in only one size, 8 inches wide. There was a time in skateboarding when an 8-inch board was considered massive, but it’s pretty much the norm these days. I got used to an 8-inch board pretty quickly when making the switch from smaller boards, though the trendy 8.5-inch and wider boards seem to be going too far. But, an 8-inch board is one of the smaller sizes on the market. The Forestone’s width also makes it one of the better boards for flipping, because a skinnier board has less mass. It is just easier to get them to spin with less force. If you have very small feet, or you are very young, you might want to search out a 7.5-inch board, but anyone older than 12 should find an 8-inch board to suits them. Here is an article on the subject from Ride Channel. The Moose Old School blank deck is a blast from the past. 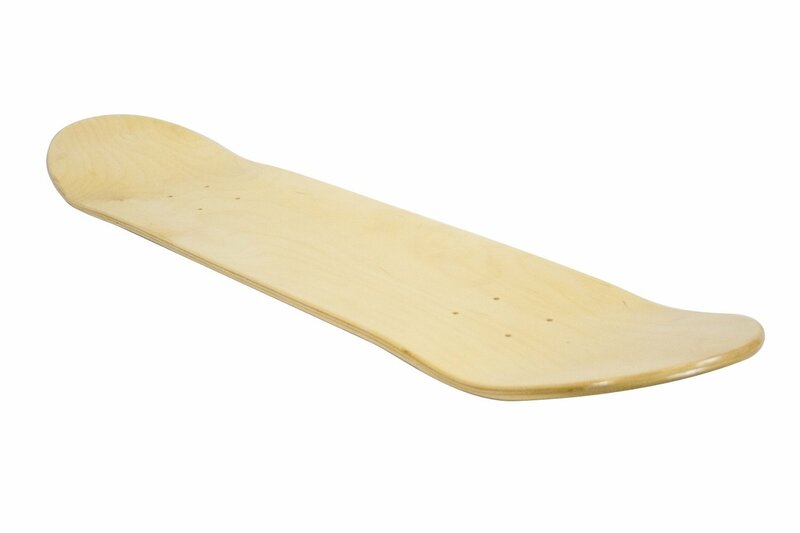 When the idea of the blank deck first took form, back in the 1980s, the first boards to be made had a similar shape to this one. One look will tell you it isn’t a trick deck, but boards like this Moose elevate the fun factor in a session. The Moose Old School is 10 inches wide and 30 inches long. These wide, old-school shapes make great boards for pool riding, or for skating other big transitions. As a beginner’s board, they will suffice for the earliest phases of learning to ride. The platform is wide, the concave is useful without being deep and the big tail makes learning to ollie easier. By the time you are ready for flip tricks, the Moose will be toast anyway. Longevity on these old-school boards tends to look a little shinier than it really is. The fact that these boards aren’t being used for stair jumps or handrails has a lot to do with their long lives. But the fact is these are also quality boards. Some skate shops are still selling the blanks even Moose as their shop board brand. For a tutorial on what pool skating looks like, as well as a chance to see one of the greats, check out this Thrasher Classics posting on YouTube of Christian Hosoi’s part in Santa Monica’s Speed Freaks, ca. 1989. SCSK8 is a growing name in affordable skateboards and longboards. While not a core skateboarding company, their products tend to be dependable and solid. The SCSK8 Pro Deck is typical of the brand’s offerings, and is a good beginners deck. Its 8-inch width is on the small side by current standards, but is just right for most new riders. The SCSK8 Pro Deck has more concave than a lot of its competitor’s boards. The right concave depth is a matter of personal preference, though. As I got more into skating, I picked boards with progressively more concave because they are comfortable and I preferred the way they locked my feet into place. A beginner may prefer a flatter board, as I did, but ultimately you will adapt to whatever shape you choose to ride. The Pro Deck also comes with a slightly larger and steeper nose than its tail. This is typical of modern skateboards, as tricks done on the nose benefit from the bigger surface. If it seems odd, give yourself time to adjust. It will become normal over time, just as shapes change and evolve. Check out this Rodney Mullen interview on Ride Channel’s website for his take on the evolution of deck shapes. These decks also come with a roll of SCSK8 grip tape, the only board on this list with this perk. On the downside, SCSK8 blanks are not the longest lasting boards in skateboarding. They are prone to self-destruct under abuse, and they do not have the most pop when new. But, they are perfectly reasonable decks for new riders, as their shape is normal. They will last long enough to wear evenly if they are kept dry and not flung around too much. While the shop blank may not be the common sight on the streets that it once was, it is still a thing. 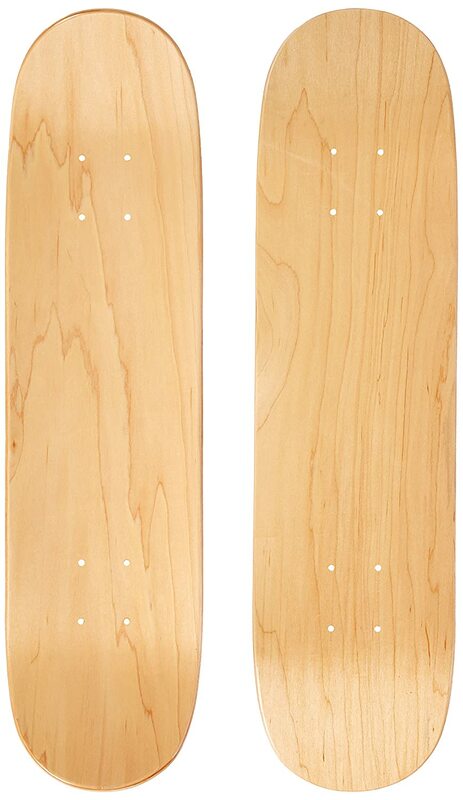 Again, skate shops sell these blanks at a fraction of the cost of their pro models in stock. They are real-deal boards with no company affiliation or pro rider, so cost is reduced. 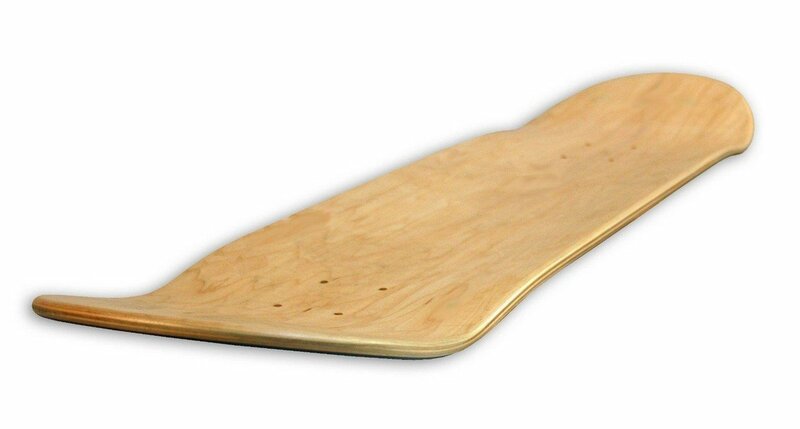 Frugal skaters, or those on a tight budget, often resort to these boards when it’s time for a new deck. Moose blank decks are a common choice of skate shops to use as their shop blanks. They are available in a variety of lengths, from mini-sized 7-inch boards to beefy 8.5-inch decks. Moose uses seven plies of Canadian maple in these boards – the most common number of plies and the consensus-best wood in skating. There are eight different widths to choose from in the Moose lineup, so finding one in the size you like is simple. There are also several colors of stained or painted boards available, though not all sizes are available in all colors. The littlest skaters should choose the smallest boards, while experienced or older riders may prefer the stable platform of a wider deck. Like many boards of this type, longevity may be an issue. But, if you are upset that your deck doesn’t last more than a few months, you’re not skating it anyway. Even a pro board will not last longer than about six weeks under heavy skating. To see an example of the type of skating that will destroy these boards, check out Aaron “Jaws” Homoki conquering the Lyon 25 in this Video. Blank Decks are aptly named. These no-frills boards are available in two sizes – 7.75 inches wide and 8 inches wide. The smaller size is great for young ones with some growing to do, or older riders getting back into skating who cut their teeth on these smaller boards. The 8-inch wide board is one of the most common widths sold on the current market, and will suit most street skaters. The concave on these Blank Decks is on the mellow side, which is good for beginners or those who simply prefer flatter boards. For experienced rider, they may be a little overly flat, but they are still perfectly skateable. For street skating, these blanks are comparable to anything else on the market, at least in terms of shape and size. While these blanks are as tough as most any other board of their type, it is worth mentioning that they are also as prone to failure as any other board as well. If abused, or even used hard in street skating, they will not last very long. Some of these blanks may have filler material used in various places, but this is not a regular occurrence. As a beginner’s board, or a tide-over until better wood can be located, they are good enough, though. So what are the Best Skateboard Decks for you? In this battle of the naked decks, the Moose Blank Deck is the clear winner. It has the most size options to please the most riders, and colored stains provide an extra layer of personalization. They also have the most pop of any board on this list, though they don’t beat the others by a lot. The Moose blanks are great decks for beginning riders, as well as those hard up for a deck, and they can last a decent amount of time if not ridden to extremes or neglected. Like the other skateboards on this list, the Moose board does away with the middle man and takes the product in a more direct route to the buyer. This saves the end user money, but it also costs pros and skater-owned companies money in the long run. Generic blanks take up a niche that needs filling, and saving money on boards is something we all must do at times, especially when beginning in skating. As you progress, however, consider supporting the pros and companies you like so that skateboarding can survive into the future. Read a retailer and attorney’s opinion on the evolving skate market here. Just remember: you support skateboarding best when you ride often. So, skate every day and live hard!